Mini soccer is a popular junior boys’ sport offered at Tom Newby School. It plays an important role in the development of soccer and ball skills and prepares young players for senior soccer. Mini soccer is a non-league activity and players are encouraged to develop a love for sport and participation rather than pursuing a ‘win at all costs’ goal. Mini soccer is offered to boys in Grades 1 and 2. 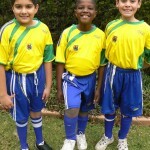 Players wear the official school PT kit for practices and matches. Players are required to provide the following: shin pads, soccer boots and socks.